A beautiful box of homemade chocolates has become one of my favourite gifts to give during the holidays. You can buy pre-made chocolates from any store, of course, but they’re usually made of high-fructose corn syrup, dehydrated milk powder and preservatives, and thus aren’t vegan. If you really want to present something special, why not learn how to make them yourself? Chocolate-making isn’t just for professionals. If you can get your hands on chocolate candy molds, it’s super easy, and you can have fun coming up with different fillings—there are endless flavour and texture variations. The molds are usually made of plastic or silicon and come in a variety of shapes and themes to suit any occasion. I bought mine at a local bulk food store, but you can also find them online. The first step to making chocolate candy is learning how to temper chocolate. Tempering refers to a process of heating and cooling the chocolate to specific temperatures so the cocoa butter in the chocolate forms even crystals. Chocolate doesn’t always need to be tempered when melted—for instance, tempering is unnecessary when chocolate will be combined with other ingredients for baking. However, if you’re going to be dipping centers in chocolate, or making solid chocolate candies, you will want to temper your chocolate to produce a stable, beautiful, appetizing candy. Click here for a primer on tempering. It’s really not that difficult once you get the hang of it. The next step is the fun part: experimenting with different fillings. Don’t worry, there is no need for candy thermometers or boiling hot sugar—just simple stir-together ingredients. I recently came up with a healthy gingerbread filling that is perfect for a winter treat. The fiery bite of fresh ginger is combined with cinnamon, nutmeg and cloves to deliver a classic gingerbread taste sensation within a chewy base of almonds, dates and coconut. The filling recipe also makes use of a new sweetener I recently picked up. Coconut nectar is a naturally sweet and nutrient-rich sap that comes from the blossoms of a coconut tree. The sap is low glycemic and contains 17 amino acids, minerals, as well as vitamins B and C. The Coconut Secret brand I bought says it’s grown without chemicals, pesticides or herbicides. 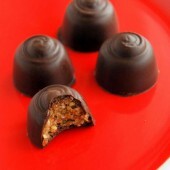 This mild-tasting sweetener combined with dried dates give this filling all the sweetness it needs. No one will believe these decadent little goodies are vegan and full of goodness. Enjoy! In a food processor, process the almonds and coconut to a coarse meal. Add the flax, cinnamon, nutmeg, cloves, salt and dates and process until thoroughly combined. Finally, add the coconut nectar, coconut oil, ginger and vanilla and pulse just to combine. Transfer the mixture to a bowl and refrigerate until ready to use. 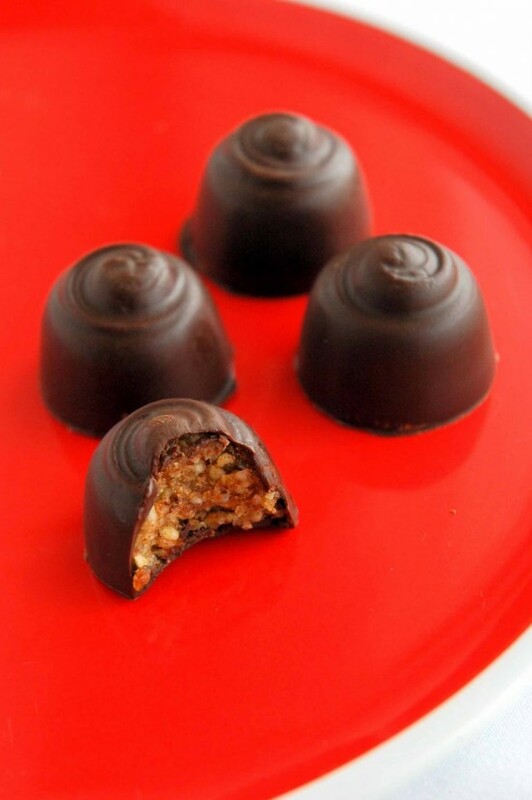 Melt the chocolate in a double boiler using the tempering instructions here. When ready, cover the inside of the candy molds using a teaspoon or your finger (just thick enough so that you can't see through the inside of the molds). Refrigerate for about 15 minutes to allow the chocolate to set. Next, fill the chocolate molds with the gingerbread mixture, filling to the top of each mold. Then, using a teaspoon, cover the tops of the molds with more chocolate, making sure to even it out. Tap the mold lightly on your countertop to break any bubbles that may form in the chocolate. Refrigerate for an hour before attempting to remove them from the molds. Chocolate candies can be stored in a tightly covered container in the fridge for several weeks.